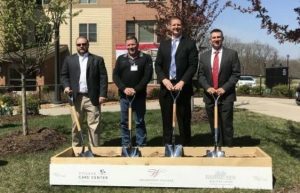 This multi-phased project consisted of significant upgrades to the entire senior living community with improved accessibility and an updated modern look. The central commons building was remodeled to include a bistro, media center, lounges, an arts & crafts room, theater, library, and exercise rooms to improve the quality of life for all residents. An expansion to the commons building included a full-size auditorium equipped with acoustical wall panels and a complete audiovisual system catered to the hearing impaired. Conversions to the north wing of the campus included one full floor of memory support and two floors of assisted living spaces. Each of these floors includes common area kitchens, bathrooms, and entertainment areas so residents don’t have to travel far to the main commons building for amenities and activities. The marketing suite was also renovated to help sell and showcase the repositioning to the community and provide tours for the new assisted living building.